Scottish side Edinburgh will host Irish giants Munster on Saturday at Murrayfield, in a one legged European Rugby Champions Cup quarterfinal. Edinburgh is having a good season this year. The hosts are currently sitting on the 4th place in Conference B of the Pro 14 with 9 wins and 9 losses, and have honest chances to at least finish Top 3. In the Champions Cup Edinburgh has been more impressive winning a group with Montpellier, Toulon and Newcastle, losing just 1 game out of 6. Last weekend Edinburgh recorded a remarkable home victory over the mighty Leinster in the Pro 14. Munster is standing on the second place in Conference A of the Pro 14 with 13 wins and 5 losses. The visitors won their group in the Champions Cup with a 4-1-1 record against the likes of Exeter, Castres and Gloucester. Munster reached the semifinals of the Champions Cup in the previous two seasons, and it would be considered a failure if they do not repeat that performance this year. 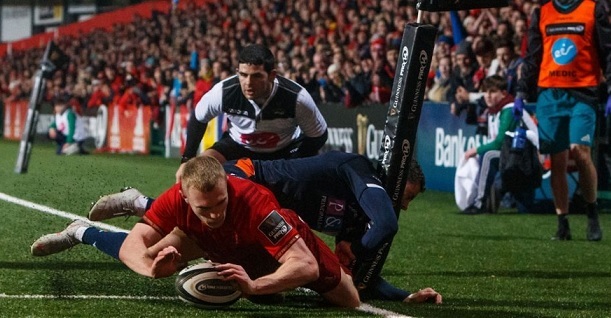 Bet on Edinburgh vs Munster and claim your 100% (120 Eur) freebet at LSbet now! Both teams are close to full strength and will field pretty much their best lineups for this one. This should be a cracking quarterfinal. Munster is the (slightly) better side and is much more seasoned at this level in this competition, but Edinburgh is a strong outfit in good form and is playing at home. Edinburgh has 11 wins and 1 loss in 12 home matches in the Pro 14 and Champions Cup this season, so Munster will not have an easy task at all in Scotland. With a balanced matchup and considering the stakes of this match, chances are we will see a tight, rugged encounter, in classic British style. Munster is the best defensive team in Europe this season, having the best defense in both the Pro 14 (15.8 pts allowed per game) and in the Champions Cup (12 pts allowed per game), and you know their defense will surely turn up again for this clash. Edinburgh isn`t a particularly great offensive team, so they will likely have problems breaking down the visitors. Rain is expected on Saturday in Edinburgh, and even though it`s unclear if it will rain during the game, there will be humidity and slippery conditions. That could determine handling errors and force the teams to focus more on pick and go`s and on a power game with the forwards. That is something they like to do anyway. Expect a defensive battle between two evenly matched sides with powerful packs. My tip will be under 41,5 total points to be scored. When the two teams met earlier in the season Munster won 44-14 in Ireland, but that was a completely different game, at a different time, with different lineups and with less importance. Prediction: Edinburgh – Munster 15 – 16.